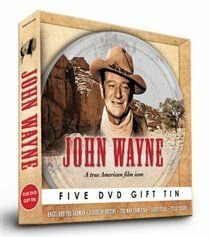 Collection of five classic Western films starring John Wayne. In 'Angel and the Badman' (1947) Wayne plays Quirt Evans, an injured gunfighter who takes refuge on a Quaker family farm and is nursed back to health by the daughter Penelope (Gail Russell). As Penelope grows fonder of the fighter she tries to explain to him that her religion does not tolerate violence and that if he wants to be with her he must learn to change his ways. 'Riders of Destiny' (1933) sees Wayne star as Singin' Sandy Saunders, a government agent who goes undercover to prove that a notorious crook is controlling the water supply that is supposed to feed into the local ranches. In 'The Man from Utah' (1934) John Weston (Wayne) faces tough competition in a horse-riding rodeo as he comes up against riders who are prepared to do just about anything to make sure he doesn't take the crown. In 'Lucky Texan' (1934) young Texan Jerry Mason (Wayne) and experienced rancher Jake Benson (George Hayes) discover a goldmine and join forces in order to maximise their profits. 'Texas Terror' (1935) sees Wayne play John Higgins, a sheriff turned prospector who, in an attempt to relieve his guilt over the shooting of his best friend, travels to Lazy End Ranch to help his friend's daughter keep the place going.